A medical marijuana dispensary has been proposed to be located on Harvard Ave in Allston and is moving through the state approval process. The proponent, Compassionate Organics, is a registered Massachusetts taxable non-profit corporation and is seeking to secure state licensure to operate a Registered Marijuana Dispensary. The company has been asked by DPH to submit a Siting Profile, having already completed the first two steps in the approval process by submitting an Application of Intent and a Management and Operations Profile. This group intends to operate both a retail location at 144 Harvard Avenue and a delivery service. The marijuana would be grown off site, at a separate facility in Fitchburg. 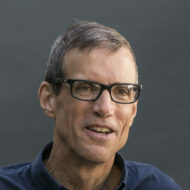 The company has secured signatures on a petition indicating non-opposition from nearby businesses and a letter of support from the Allston Civic Association. In November 2012, 65% of voters approved ballot question #3 to legalize medical marijuana. You can review the regulations or for general information visit the DPH website on the medical marijuana program. 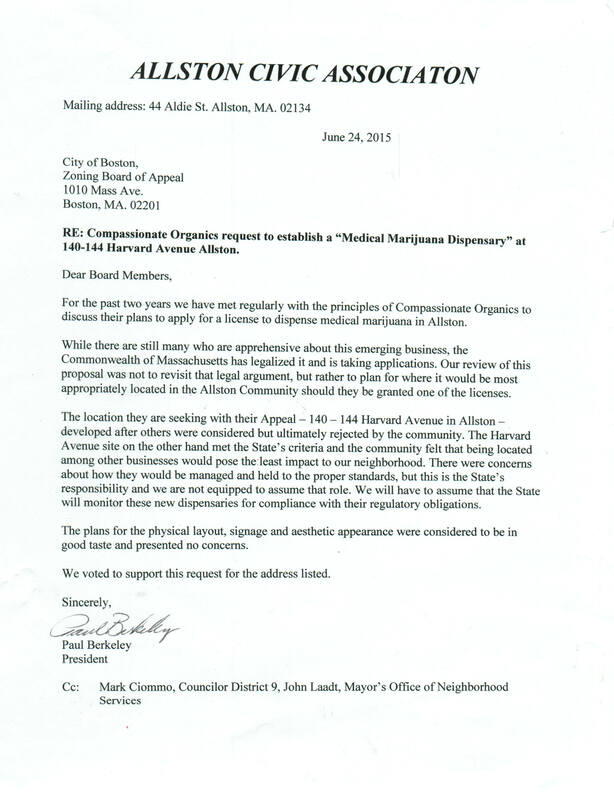 Senator Brownsberger wrote a letter to DPH, informing the Medical Marijuana Program Director of the positive feedback received in support of a dispensary in Allston Village. Another group, Mayflower Medicinals, has also proposed a dispensary in the Allston Village area – 230 Harvard Avenue. As with the proposal above, it is in the siting phase of the licensure process. I am in favor, and urge the senator to vote in favor as well. Yes, please approve this. We need access to a shop in this area. I think the market for this shop is excellent. It’s accessible to a large number of people along the Green Line, is close to hospitals, and is away from most underage/family locations. I support legalizing marijuana and a medical location and believe that this is a respectable and well-regulated place to start in Boston. I am in favor, as were the majority of Mass residents that voted for this. I am 100% behind the idea of putting the dispensary in Allston. Harvard St is a perfect location for such an establishment, as it is easily accessible by public transit. The dispensary would fit great with all the other stores that are located in the neighborhood, especially, several medical businesses that already operate there. Senator Brownsberger, you got my vote on this issue!!!! I support opening a dispensary on Harvard Ave. Senator, I too support a medical marijuana facility in Allston. A personal note: In 1995 I spent most of the year in an experimental chemo. treatment program and was given artificial THC for the adverse side effects. It did not work, so I switched to ‘natural’ THC (smoked small amounts of marijuana in the evenings) and it allowed me to keep down meals and get better sleep. I told my oncologist about the switch and his response was: You’d be surprised how many patients tell me this. Thank you for taking this up. I am fine with the idea. People should be able to deal with their health issues without going to Colorado. Or wherever. I support the proposal. The location is convenient and has a strong level of support, so it sounds like a strong plan. As a longtime Allston resident I support this proposal, and support the Allston Civic Association’s very reasonable supporting letter. The site impinges on no neighborhood, and is appropriate in every way for what will be a legal, highly regulated retail business. I hope the legislature will concentrate on giving the regulators the means they need to monitor this business, a responsibility that could increase greatly if full legalization is around the corner (as I suspect it is). Thanks to the Senator for his interest in our opinions. I support opening a dispensary on Harvard Ave. in Allston. We should have a medical marijuania in Allison. Abutters should give you an idea how it is being received. The area needs better security due to crowds of students and bar people who become rowdy at night. I would think this operation would put betterments in place for their safe operation. It is a dense area which may be an opposition but they might be the right tenant to clean up the area which some may not understand, but I feel they would. Thank you so much for telling me about this medicalI facility. I would be so grateful for the retail location at 144 Harvard Ave & even more-so delivery service. This will help me with my PTSD tremendously. God bless everyone who made this possible.